Inga Wind, Designer of Inga Wind Designs, started with “Penelope” and “Bartelby”, a wonderful details and lovely looking couple outfit. Inga Wind:”Penelope” is an amazing blue formal dress. The basic is made in a non symmetrical manner that makes a bare right shoulder while the left shoulder is decorated with an amazing detailed sculpted prim. The top layer has a very elegant texture that is broken by an awesome lace stripe that runs diagonal from the right upper to the left hip. The skirt as well continues the non symmetric look. On the left side it goes further down with a wonderful ornamented sheer texture that is framed by an opaque looking satin border and the left is lightly shorter. Gloves, shoes and the lovely headpiece come with the whole outfit so you have no trouble to match the right color and look. “Bartelby” was made to match “Penelope” perfectly. 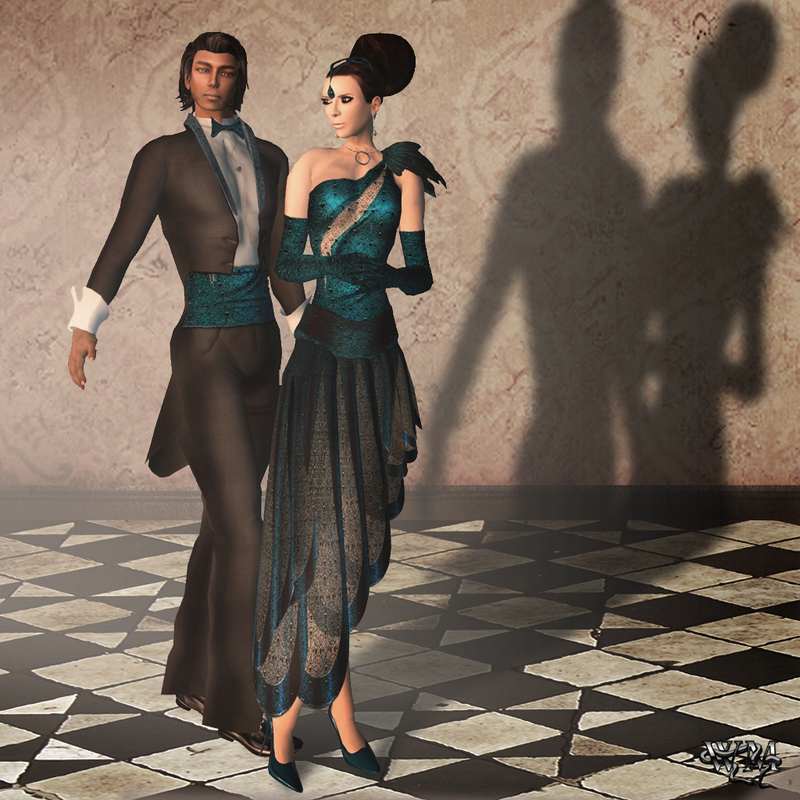 The black basic makes a wonderful tailcoat with amazing flexible prims in the back, where the seams carry the same texture that you already saw on “Penelope” as well the little neat bow tie. The white shirt shows off folds and shadows in a very realistic way. Collar, bow tie, cuffs and Sleeves are made of sculpted prims what ad as well a very realistic touch. The black pants complete the elegant male look and the sash round the waist again shows off the amazing blue texture decorated with filigree ornaments and buttons. This entry was posted in Events & Contests, Fashion, New Releases and tagged 3D, 3D people, Arisia Ashmoot, Art, Avantgarde, avatar, award, Baiastice, Blog, Blogger, blogs, bodytalking, BOSL, boy, builder, Challenge, Champagne, Claim the Fame, clothes, Clothing, competition, Couture, creations, Designer, district, dousa dragonash, Eshi Otawara, Fashion, Female, Female Clothing, female wear, Finesmith, Finesmith Designs, Formal, formal attire, free spaces, Glam Affair, Gowns, guy, haute, Inga Wind, Inga Wind Design, kult sim, m&m creations, magazine, male, male clothing, Mea Culpa, meta virtual, Metaverse TV, metaversetv, miss ebony international, Model, Modeling, New, New Release, New Releases, News, photographer, prize, rentals, sculpties, Second Life, Secondlife, Show, Skin, SL, SL Clothing, SL Fashion, SL Style, SL-Art Couture, Style, suits, sYs, Tatanka Kaligawa, templates, textures r us, theater, Virtual World, Wicca Merlin, woman, Yula Finesmith. Bookmark the permalink.